My family is not committed to a gluten free or vegan lifestyle, but I love finding recipes that fit the bill so I can cook for friends with dietary restrictions. This raspberry scone is almost better than the traditional white flour and butter version and was easy to make. 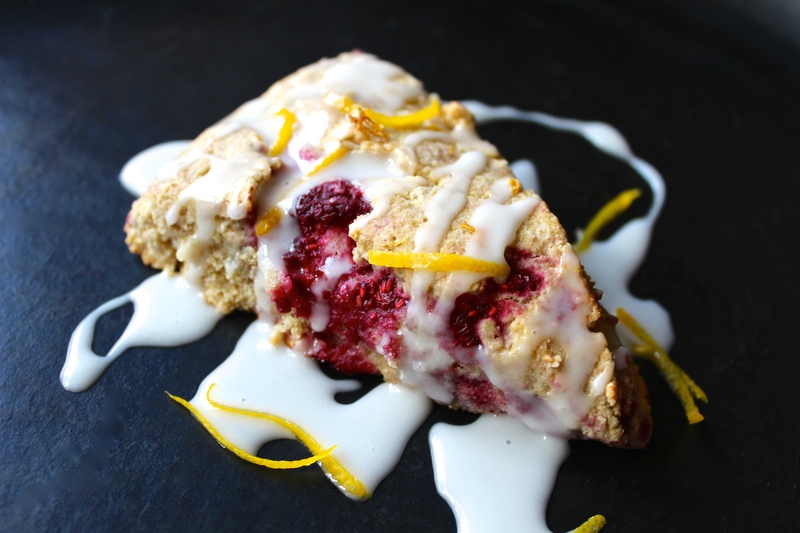 The original recipe comes from one of my favorite blogs, Love & Lemons (click here for their vegan coconut raspberry scone recipe). Raspberries are full of vitamin C, manganese, and fiber (among many other important nutrients). But if you really want to appreciate the health benefits of the humble raspberry, look up the research findings about their cancer fighting potential. If I understand correctly, cancer cells do not thrive in the presence of ellagitannins which are found in raspberries. These little phytonutrients are converted in our bodies to ellagic acid, which sends signals to cancer cells encouraging them to die (a process called apoptosis). With this knowledge, I won’t hesitate to add more raspberries to my family’s daily five. Preheat oven to 400 degrees. Combine oat flour, coconut flour, sugar, baking powder, and salt. Cut in the chilled coconut oil with a pastry cutter. Stir in almond milk, raspberries and lemon zest. Place dough on lightly floured surface, shape into a circle and slice into 8 wedges. Bake for approximately 15 minutes. Mix the powdered sugar and 2 tablespoons of liquid if you desire icing. Did you enjoy your daily five?